ordan and Iraq took the first step towards creating new, clean-air countries by banning smoking in public places. They now have joined the many other nations in the Middle East such as Qatar, Turkey, United Arab Emirates and Afghanistan, who are fighting tobacco addiction. The Jordan Ministry of Health announced that smoking in public places including the airport, malls and tourist-related restaurants is banned as of March 2009. The ministry will carry out the law by imposing a JD15-25 fine on those caught smoking in public facilities or a penalty of imprisonment ranging from one week to one month. In addition, the ministry provided for each institution to choose one of its employees as a law enforcement officer to make sure that people are obeying the smoking ban in these places, especially in governmental agencies. Most of the country’s malls have already begun implementing the new ruling, with progress going well and people now able to breathe clean air. The Iraq Parliament has imposed a new smoking ban in all government, school and other public sector buildings to help reduce statistics which currently estimate that 55 people die each day from smoking-related illnesses. The goal is to eventually forbid smoking in offices, cafés and on public transport as well. Substantial fines of up to US$4,000 for violating the law will support its adherence plus a smooth and effective implementation. In recognition of their landmark legislation to decrease smoking and to promote the health and wellbeing of the citizens, Supreme Master Ching Hai gave Jordan and Iraq the Shining World Leadership Award. 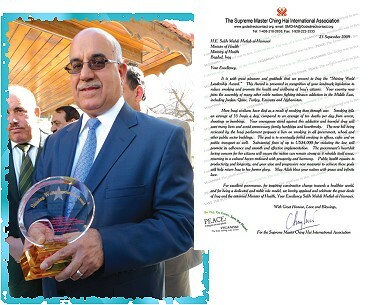 On January 28, Golden Year 7 (2010), the Award plaque and the framed letter from Master were presented by our Association members to Iraq’s Minister of Health, Mr. Salih Mahdi Mutlab al-Hasnawi, at the grand opening ceremony of the first Iraqi Health Office in Amman, Jordan. The Iraqi Health Minister, the Jordanian Health Minister, the Iraqi Ambassador and nearly 200 important VIPs from the largest NGOs were in attendance, including representatives from UNHCR, WHO, CARE, the International Red Cross and many others. Thirteen television stations were there covering the event as well as Supreme Master Television. Many government officials also received Master’s DVDs and books. Mr. al-Hasnawi was very touched and almost moved to tears during the Award ceremony. There was a very high and noble understanding and acceptance of the intent of Master’s message, not only by the Iraqi minister but also by the Jordanian minister, the Ambassador and the other officials in the room. 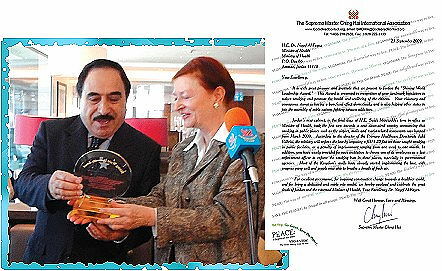 On May 18, our Association member presented Dr. Nayef Al-Fayez, Jordanian Minister of Health, the Award, the accompanying letter from Master, a selection of Her books, DVDs and CD’s as well as some chocolates, in the Groud Hotel Kempinski in Geneva. The Jordanian Ambassador to the United Nations and several other officials were also in attendance. Dr. Al-Fayez was very pleased and expressed his warm gratitude, adding that Jordan is also going to ban smoking on buses and trains. 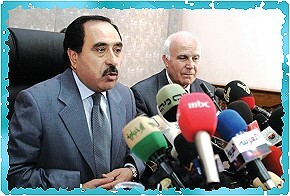 Our appreciation, Jordan and Iraq, for these measures to improve the lives of your fellow citizens. May many governments be similarly inspired to strive for the blessing of clean air and a smoke-free world.